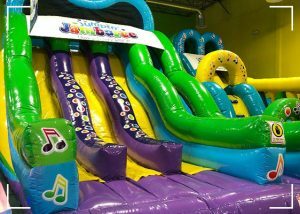 When you need to find a place to host your special event for kids, Jumpin’ Jamboree is the perfect choice. Our indoor playground is a great location for your event, no matter what it is. We have the space to accommodate your needs and a ton of inflatables to keep all of the kids entertained! It is easy for you to host your kid’s special event. As a parent, planning events for your children’s groups, class, or team can be stressful and not fun. But planning it at Jumpin’ Jamboree is a great way to make it simpler for you and ensure everyone has a great time. Whatever type of family-friendly event you are planning, Jumpin’ Jamboree is a great choice. Our inflatable playgrounds will entertain all of the kids at your event while the adults can mingle in peace! Whether you are planning an event with your friends with kids or a party for your child’s soccer team, our indoor playground will provide everything you need. Another benefit of choosing Jumpin’ Jamboree for your event or fundraiser is that we offer special rates for groups. If your group includes more than 10 children, you can enjoy a discount that makes hosting at our play place even sweeter! You can learn more about the group rates here! Next time you are planning an event for your children, be sure to take a look at Jumpin’ Jamboree! We can help make your event extra special and exciting for everyone! Keep the kids entertained and having fun while the adults mingle. Start planning your event at our Doral location! Contact us today to reserve a spot for your kid’s special events! We look forward to hosting you.